Golfers are going to be out in droves this Memorial Day Weekend; some have only pulled out their sticks a few times this season while others have been playing for months. There will be those golfers out purely for the enjoyment of the weather and there will be competitive players seeking the win. Whether you are a beginner or a seasoned golfer, consider taking away these swing thoughts for use during your round. 1. Try not to fill your head with swing thoughts! Pick only one or two during the round and stick with them. My latest swing thought is to keep my elbows connected losing that dreaded "flying elbow" that has recently crept its way into my swing. Adam Scott agrees stating, "Whatever I'm working on, I like to keep one swing thought in my head when I'm on the course. Keeping it simple helped me at the Deutsche Bank Championship in Boston last year." 2. Are you trying to regain composure after a blow-up hole? What's next, you think...another bad shot? Thoughts like this will have you spiraling downward, spewing curse words and throwing your golf clubs into a retention pond! Instead, think about the "C" word...Confidence. Remember that one or two shots will not ruin your round, that you have hit good shots in the past and focus on the next shot instead of dwelling on something that is already past. Read these Golf Tips to Improve Your Game from Tee to Green. 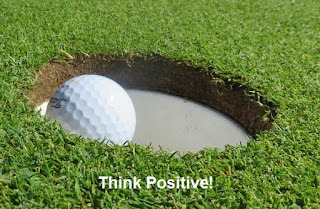 Look at the Positives of a Golf Hole: In his GolfTV.com video, Dave Marsh says that most players look down a par-five and immediately notice the trouble; the patch of grass or the bunker that they have to fly over...don't be that guy! Instead, when you step onto the tee box, look down the fairway and "pick three things you really like about the hole," and where you are going to place that golf ball. A negative approach will almost always lead to some type of golf course meltdown so take each shot and hole as its own adventure, remain positive and look for a way out of trouble. Follow the words of Bob Rotella'sbook cover which says, "Golf is Not a Game of Perfect." Which swing thoughts have helped improve your golf game and outlook on the course? Let us know below in our golf blog comments section and on Twitter @Golf4Beginners!